When we think about flea control spot-on treatments one name that emerges in our mind is Frontline Plus. Straight from the house of Merial, this flea killer and preventive has made a mark for itself. Another Merial product that is fading away these days is Frontline Spray. However, the spray form of flea medication is given a cold shoulder by pet parents. There are many advantages of using sprays over spot-on treatments. Easy to use: Sprays are very easy to administer across the pet’s body. All you need to follow is keep it away from your pet’s eyes and mouth. Using spot-on flea treatment is a little cumbersome job than using a spray. This is the reason hospitals and animal welfare institutes choose a spray form of fipronil over other spot-on treatments. Spray on folds and hidden areas: The best part about sprays is that you can specifically use in areas like the folds of the pet’s body, the gap between the toes, armpits, bottom of the tail etc. By reaching out to these places, the treatment gives flawless results by killing fleas and ticks hiding in these areas of the pet’s body. Quick results: Spray is a quick flea killer, as it takes no time to spread across the body. Unlike spot-on treatments, that takes hours to spread, sprays spread at the very moment. They kill the existing fleas within no time. Thus, sprays start eradicating fleas instantly when applied at the dot place. Being waterproof, they keep on fighting with fleas for a long time. Cheaper alternative: Sprays are cheaper alternative compared to their spot-on counterparts. This is because one or two pumps per kilogram of body weight are enough to destroy ticks for a month and fleas for a quarter of the year. Therefore, if you have more than one pet you do not need to buy separate pipettes for all. You just use one spray for all and you are done. 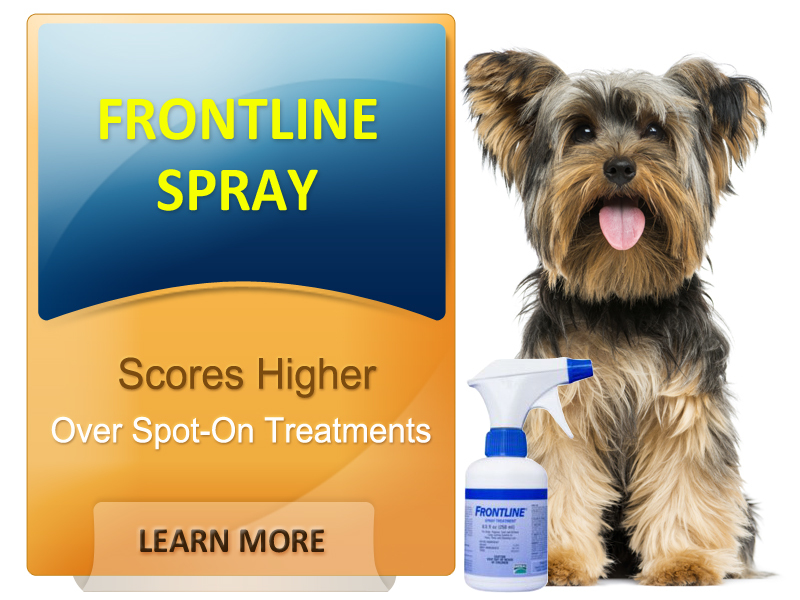 To comprehend, it would be correct to say that Frontline Spray is a highly reliable form of flea control for dogs. It has many benefits over spot-on treatments making it a lucrative option. The flip side is that you need to be careful while applying it as it should not enter your pet’s eyes and mouth. Debarring this, choosing spray over spot-on is a wise decision as it saves money and gives quick results.